*Prince’s 21-night stand at the forum in Los Angeles (Inglewood, CA) is definitely the place to be seen. Thursday night Whitney Houston showed up during Chaka Khan’s set (Chaka opened that night for the Purple one). Before you knew it Whit was on stage with Chaka. We’ll let you decide how her singing sounded. Check it out below. 1. WHO put that video up? It’s CHAKA, not Shakka…. 2. Agree with Gurlfrand about Chaka. 3. Whitney needs to stop it. For real. Just stop it. 4. I’m happy to see that Whitney has picked up some weight. She looks healthier. However, a pair of Spanx will do wonders…. agree with your line item #4, cause she looking spank-a-dank-dank right now…..
Whitney sounds winded and is a mere shadow of her former self. 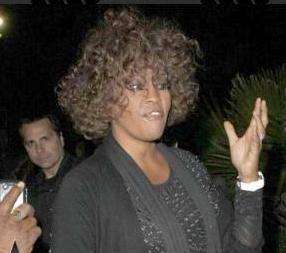 Whitney is a shadow of her former greatness also she does not care about being as well groomed as she use to be. *SMH* Chaka didn’t need any help. Whitney sounds terrible. It’s really sad to hear what her voice has become. She sounds like she’s ‘bellowing’ the lyrics instead of singing them. I wouldn’t say Whitney doesnt care about the way she looks. She like a lot of women don’t wear flattering clothes that complement their figures when they put on weight. She shouldn’t have had that outfit on with the amount of weight she has gained. If she didn’t care about her appearance she wouldn’t have bothered putting on make-up and doing something to that hair. She is still an attractive woman it wouldn’t hurt her to try to slim down the midsection so.